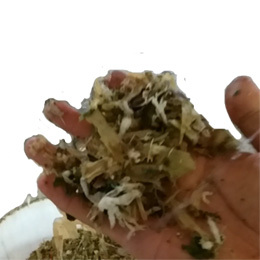 Organic & food waste in pieces including packaging must be shredded to prepare optimal substrate for the fermentation. TIMO provide reliable organic & food waste recycling system for this application. The system include bin-lifter, sorting platforms, industrial shredders, dewatering machine, discharge aguer conveyor and stored tank or fermentation tank. 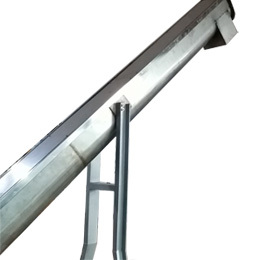 We can customized provide the bin-lifter for the different size of the bin. The sorting platforms can be design with the capacity on 2-10 people. 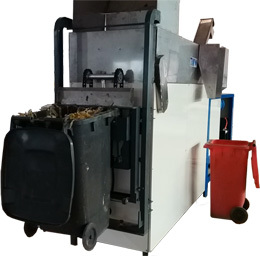 The industrial shredder can handle wet and dry materials, they employ two parallel counter rotating cutters that intermesh at low speed under extremely high torque, as the scissor type cutters intermesh at close clearance, they cut, shear, tear, press and rip apart the organic & food waste into smaller pieces typically in a strip or chip-like output shape. 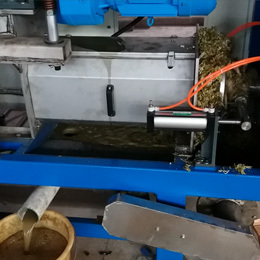 The dewatering machine just setup under the industrial shredder squeeze liquid out of organic material, operating in a continuous (not batch) mode. The parts which touch the liquid make by stainless steel SUS304 to make sure the long lifespan, the raw organic & food waste material contain water 30-80%, after squeezing, the moisture content of final product is about 30-40%, you can’t press out any water by hands. 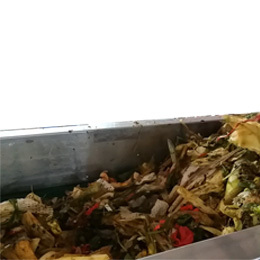 Finally, the shredded and dewatered organic waste convey to fermentation tank, the fermentation tank is one of the key equipment in the organic & food waste composting industry. The fermentation tank can make raw materials into ball shape particles, with the features of large capacity, low energy consumption and low maintenance cost. Please kindly refer the 3D layout of the system as below. The procedure of shredding and dewatering is essential to convert organic & food waste to fertilizer. Our machine which integrate industrial shredder and dewatering squeezer is the ideal solution in this procedure. The industrial shredder and dewatering squeezer can reliably and efficiently prepares the organic & food waste to be fermentation substrate. The successful project below locate in JinLin province make you understand our machine more. Food & Organic waste composting pre-treatment system including bin- lifter, manual sorting table, industrial shredder & dewatering squeezer combo machine, auger conveyor. The working process of the system is as follow: 1 The bin-lifter can load 120L or 240L bin food waste to the manual sorting table.-->2. 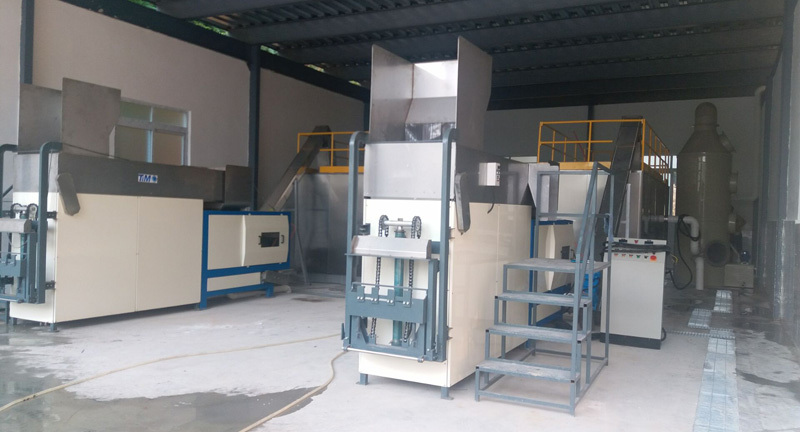 The food waste pour to moving belt and go forward, the operator can sort the foreign such as metal, plastic bag out.-->3.The industrial shredder & dewatering squeezer combo machine means that it integrates a industrial shredders with a dewatering squeezer in one machine. 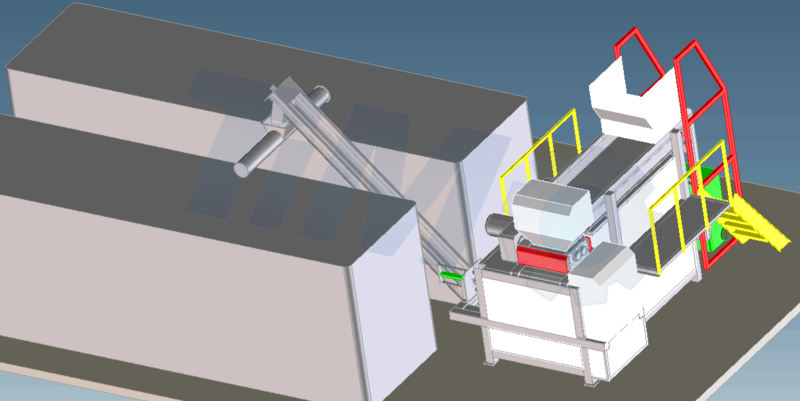 The industrial shredder on the top of the combo machine will cut the pure food waste down to size first, about 36*12mm, then the shredded food waste will drop to hopper of the dewatering squeezer which underneath the shredder by gravity, the squeezing shaft will push the food waste against the stainless steel screen and back-pressure cone, the cone will not release until the pressure reach the setting point, and the solid food waste cannot pass through the 2mm screen, so the liquid will be squeezed out from the screen, and the solid food waste will be discharged from the gap between the cone and the squeezer shell.-->4. 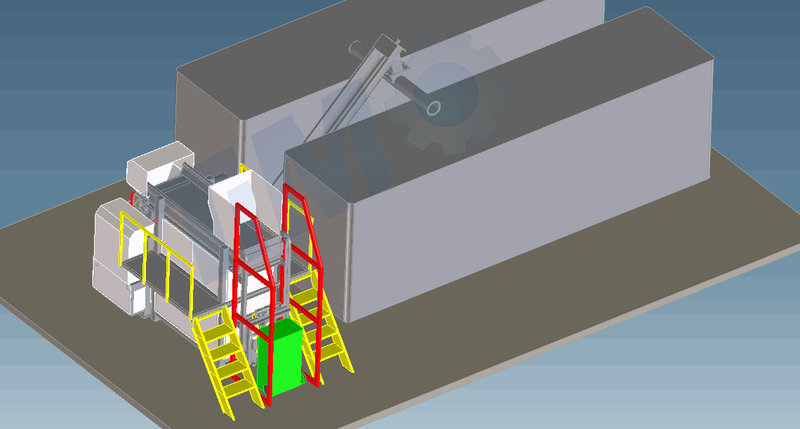 The shredded and dewatered food waste fall off to the hopper of the auger conveyor, the screw will convey the waste to the collecting big container. 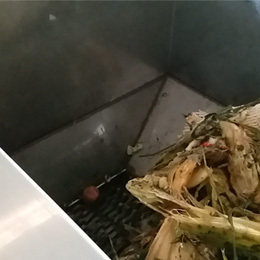 Food Waste Composting Pre-treatment System Working Site. Except for the organic & food waste recycling application, our industrial shredder and dewatering squeezer is also a good assistant on unpacking the expired foodstuff such as packaging beverage, soft drink, bottled water, milk drink. Packing food whose“best-by” date has passed are usually throw away directly as the rubbish. But actually, the packaging material such as plastic packing, aluminium cans can be recycled. Our industrial shredder and dewatering squeezer can destroy the packaging and separate the packaging material and drink inside automatically, with the high efficiency and reliable machine operating, you can save a lot of time and the cost of labor to manual operation. The project below located in Shenzhen city can make you know more the advantage of our machine.